We had an exciting weekend of Pro Tour coverage, with many of us following the coverage live, or at least tuning into the expanded chatter that social media brings to our fingertips. Many of us acted on what we saw in coverage and what we heard through our preferred social media channels. Some of us probably even received multiple emails telling us all the hottest cards of Pro Tour Dragons of Tarkir. Every time a card that hadn’t already spiked appeared on screen, a flurry of activity ensued. I know that I immediately rounded out a playset of Den Protectors on Friday when I tuned into multiple rounds highlighting the card. And now plenty of people are the proud owners of way too many Den Protectors—congrats, guys, you won! After all, nothing could possibly go wrong at this point, right? The card more than doubled in value, so all these buyers essentially doubled their money in three days. You’ve gotten all those copies you bought in the mail already, right? Zero Den Protectors… but that doesn’t mean it’s not a good card, right? I bet we’ll see a lot of them in good Standard decks that people who didn’t make the top eight played, right? Seven Den Protectors, but I mean, come on, right? Winning eight rounds of Standard at the Pro Tour is hard. It has the best players in the world, after all. Two. Yes, the word “two” is a complete sentence, so get over it, grammar boy [Editor’s note: I think he means me…]. A total of two Den Protectors showed up in one list that performed 7-3 in the Standard portion of the Pro Tour. So taking a look at the 56 best-performing decks in the Standard portion of the Pro Tour, only three of them included Den Protector, a fact that can’t be ignored unless CTRL+F is somehow malfunctioning in my browser… in which case, we’ll just carry on as though everything I’m saying is still factual. When you’re looking for a rare to speculate heavily on, picking the card that appeared in less than six percent of the successful decks at a tournament is probably not where you want to be. But the good news is that all of the folks that bought these up should get most of them in the mail around the same time the price crashes back down to the price they paid. Sorry, guys! 1. One who rules during the minority, absence, or disability of a monarch. 2. One acting as a ruler or governor. 1. Learn to play Magic. 2. Top eight Magic Game Day. Notice how step two is filled in here? If you take a look at how Thunderbreak fared at the Pro Tour, you’re going to see some significantly different results. A total of forty copies showed up in the top-performing Standard lists across ten decks, a little over 17 percent of the field. While Thunderbreak didn’t show up as much as Siege Rhino (14 decks), it’s probably a safe bet that there are significantly fewer Thunderbreak Regents in the world than there are Rhinos… and it also turns out that dragons have waaaaaaay more casual appeal than rhinos, unless you happen to be in the ivory trade (or whatever rhino horns are actually made out of). So what does this mean? 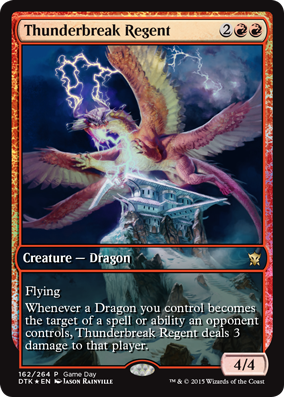 Thunderbreak is going to continue to be popular, thanks largely in part to its amazing little sidekick Draconic Roar. I still think this card has a little more room to go, probably another couple dollars after we see it tearing up an SCG open or two over the next couple of weeks, and there’s a pretty good lifespan in front of it if either Magic Origins or Battle for Zendikar feature a five-drop playable dragon to replace Stormbreath. One of the biggest pitfalls of Magic speculating is the idea that everything is a quick flip and a quick double up. This is the finance equivalent of playing roulette and putting a stack of chips on black, repeatedly. Sure, the first time you hit, you’ve doubled your money (never mind that this poorly thought out metaphor doesn’t take into account the physical shipping of cardboard thousands of miles ). Nobody can deny the appeal of buying in a ton of copies of cheap rares at $2 a piece and “selling” them for $4, because maybe making $2 on a $2 card feels cooler than making $3 on a $7 card, (shout-out to Dragonlord Silumgar). But high liquidity is hard to achieve in paper cards and one of the biggest risks to these types of spec targets is the “analog lag” we see in the time it takes orders to be picked, packed, and shipped. The lucky ones had their orders shipped out on Friday, but I’m sure that some sellers didn’t get them into the delivery pipeline until Monday. When I tuned into coverage on Friday, I saw a ton of sick plays with Protector on camera, so I added a couple copies to my PucaTrade wants list to fill out a playset. After waiting ten minutes and seeing no trades confirmed, I added two foil copies and two prerelease copies as well, figuring that I would take whatever editions sent first and remove the rest… then I fell asleep on the couch and woke up to find that I was to be the proud owner of too many copies of this card. So now I can speak from experience that going too deep on DPs is not where you want to be. I still have hope that all is not lost: I threw my Den Protectors and Deathmist Raptors into a Sultai Reanimator shell and had an absolute blast taking the deck out on its maiden voyage. Protector is a really sweet creature that allows for so much value to be ground out in the long games … I’m sure we haven’t seen the last of this card. This weekend, I also had the opportunity to work as a buyer for Nerd Rage Gaming at the SCG States in Indianapolis. Some of the things you notice when looking at binders all weekend for hours at a time are the cards that everyone wants to get rid of, the cards that nobody wants to get rid of, and the cards that nobody even had in their binders to make offers on. I bought a ton of Monastery Mentors this weekend, even after lowering the buy price. This signals that players just aren’t as excited about this card going forward and there is a good chance it’s going to keep creeping downward over the next couple months. Another card I bought way too many of was Tasigur, the Golden Fang—I couldn’t offer a number low enough to make people say “no” when it came to selling these guys. There’s a good chance that the supply of this card has reached critical mass and the people that went deep on these have lost confidence in further (short-term) gains. I saw virtually no Silumgars, Atarkas, or Ojutais over the weekend, which signals that all of these cards are going to remain strong going forward. We sold every copy of Atarka or Ojutai within a few minutes of buying them—both of these were wildly popular all weekend long. The cards that most surprised me this weekend were Dragon Whisperer and Ojutai Exemplars. I only saw one copy of each of these cards in anyone’s binders over the weekend, which is somewhat puzzling to me. I know Dragon Whisperer definitely has a fan base out there in both the mono-red and the dragon lovers communities, so I could understand that this card was being held onto by someone. But where were the Exemplars? I don’t even have an operating theory on this one outside of coincidence plus variance. Fetch lands were very liquid all weekend long: we brought them in easily and sold them just as fast. Fetch lands are a good holder of value and people’s willingness to sell them shows that they’re still readily available in trade binders. Multiple people selling me fetches over the weekend commented in one form or another that they’d be easy to replace, so that signals that it might be a while before these see any significant upward pressure. Until next time, you can find me on Twitter at @GoingMadlem, and I encourage you to check out my article on MythicMTG.com later this week, too. I’ll be going over the most fun Standard brew I’ve played in quite a while. Prophecy 2 Electric Boogolo confirmed? A few pros were very positive on Den Protector over the weekend. But as you pointed out, it didn’t have the showing we all wanted. I’ve got my 20 copies now, and I’m in the boat of either selling for marginal profits or waiting and hoping they get more time in spotlight. Maybe I’ll sell 3 sets now and keep 2, depending on how low I have to drop my price before they finally DO sell. So while not timely for us Den Protector holders, the article is spot on and highly accurate. Definitely info to keep in mind for next time around. There already is a 5-drop dragon to replace Stormbreath… his name is Sarkhan, the Old School and he’s half the price he was 3 months ago, and capable of being in far more decks than the new Sarkhan. Once Stormy rotates out he’s going to make a crazy come back. Until then you’ll probably see him at $5 over the summer which is when I’m picking up a few sets. Cutin, rhino horns are made of cutin. The same thing your fingernails are made of. Ha! We actually did a fair bit of business together @ SCG States in Indy last weekend. I dumped a metric TON of green pump, artifacts likely to be reprinted in MMA2 and tickled your fancy with a very special Tropical Island. Haven’t forgot about that either. Real life kicked back in and there’s a warehouse full of steel that needed cut when I got home. Will reach out this weekend. Great article, love the humor!! Pleasure reading your work(s). I commented on Travis’s article that I think non-foil Tasigurs might drop because Taz is a high level magic players card and it takes some thought to use him. Kinda the same with Monastery Mentor (and a lot of the Fate rares actually), most of those cards work best in a specific deck. And Tasigur’s value I believe comes from Modern and Legacy which is why foils seem the better specs. Minor comment about draconic roar and 5 drop dragons, technically both Sarkhan walkers give you a 5 drop dragon…just not at instant speed. So you could plus Dragonspeaker and then Draconic Roar or minus Unbroken to put a dragon into play. Not as great as a turn 2 or 3 reveal but there’s a little synergy there. And Jeff Hoogland built a UR dragons deck with Icefall and Thunderbreak and maybe that deck gets a little more playable after rotation. Dragon Fodder, Hordeling Outburst, Treasure Crusie, plus dragons and Roar…seems solid. I personally do not think Thundermaw is getting a reprint, I actually think he’s entirely too good. Tapping all those Ojutai’s and Silumgars and Atarkas etc and getting in for 5+ in the air seems WAAAYYYY too good after your opponent tapped out to play their super expensive dragon. Then again Wizards made a whole Enchantment block and then printed Back to Nature and 15 other enchantment hate spells. Plus he does “die to everything” so he isn’t that good right? lol. Actually valorous stance and ultimate price clean him up nicely (and plummet) so I might have accidentally talked myself into asking for or expecting a reprint. I would love to bash through my opponent’s 3/7 hexproof dragon for 5 damage!! But again I love your humor and keep up the great work. P.S. Step 1a. Pick a deck to play!! I just meant that you couldn’t reveal Sarkhan from your hand to enable the extra three damage from Draconic Roar because in your hand he doesn’t count as a dragon.